The Pyrus platform combines workflow automation, request tracking, work-related communication, and document approvals in a single interface. Pyrus' workflow engine can be configured with no need for coding and integrates with existing SCM (Supply Chain Management), CRM (Customer Relationship Management), and ERP (Enterprise Resource Planning) software, and can be accessed online and offline through the Pyrus mobile apps. 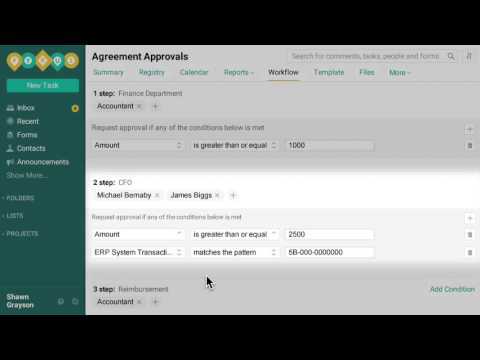 Set up customized workflows to automate processes such as routing business forms, requesting approvals or delegating routine tasks to different employees. Pyrus can be used for CRM, legal services, procurement, HR, accounting, sales & marketing, and other processes. Pyrus enables users to track important tasks, even when not directly involved, and unsubscribe from tasks when their section is complete. Integrations allow users to create tasks via Gmail and Microsoft Office, upload files through Box, Dropbox and Google Drive, and start workflows from Salesforce and Ancora. Browser plugins show how many unread tasks are in the Smart Inbox™ without the need to keep checking for emails. We're working in the insurance field and Pyrus became an indispensable tool when it comes to daily workflows. There is a mess of everyday routine, though it allows to organize everything smoothly. Highly recommended for everyday tasks and workflows. It's an interesting combination of task management and BPM (business process management). Mobile apps are blazingly fast. They do work offline contrary to many competitors (asana, basecamp). Needs desktop client. I started to use it for MBA projects to coordinate team work. It's very simple and makes it more pleasant to run a project. Subscription prices start at $5 per user per month for Business package. Prepay 10 months, get two months free. Browser plugins show the number of unread tasks in the Smart InboxTM, removing the need to keep checking email. Scheduling a task mutes that task from the Smart InboxTM, reducing the 'to-do' list; it will reappear there on the scheduled date. Microsoft Office integration allows users to turn Word, Excel and PowerPoint files into new tasks, and track tasks from Microsoft Office applications. Gmail integration converts incoming email into tasks, with any attachments automatically copied across into the new task. Set different access rights for team members, both for tasks they are assigned to and any tasks within a project. Track the progress of important tasks without participating, and still stay updated. Splitting tasks into subtasks makes them independent of each other, with their own assigned persons, due dates & access rights. The Pyrus sync extension can synchronise data, make backups and automatically export registries at predefined times and days - all over secure a HTTPS connection. Below are some frequently asked questions for Pyrus. Q. What type of pricing plans does Pyrus offer? Q. Who are the typical users of Pyrus? Q. What languages does Pyrus support? Q. Does Pyrus support mobile devices? Q. Does Pyrus offer an API? No, Pyrus does not have an API available. Q. What other apps does Pyrus integrate with? Q. What level of support does Pyrus offer? Q. Which apps is Pyrus compared to most often?